Current Culture H2O's™ innovative hydroponic systems and nutrients are used in a wide variety of modern agricultural applications throughout the world in both greenhouses and in Controlled Environment Ag (CEA) under supplemental lighting. CCH2O recently developed Cultured Solutions™, a line of balanced and chelated premium plant nutrients suitable for all hydroponics applications including Water Culture Rockwool, NFT, Ebb-N-Flow and substrate based Drain to Waste applications. 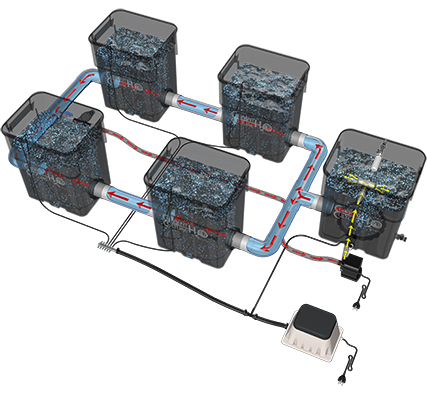 Under Current, or UC for short, is Current Culture's line of deep water culture hydroponic systems. Designed to deliver heavy yields, high potency, and increased efficiency, UC systems are some of the best DWC systems available. The Under Current ulitizes Sub-Current Culture (SCC), which employs peripheral negative pressure to recirculate highly oxygenated nutrient solution through the plant's root zone. The perpetual fluid motion supercharges the nutrients with dissolved oxygen, creating a hyper aerobic condition, perfect for explosive plant growth. Their unique water culture application is unprecedented in both their layout versatility and ease of use. The Under Current consistently delivers awe-inspiring yields for any sized application. 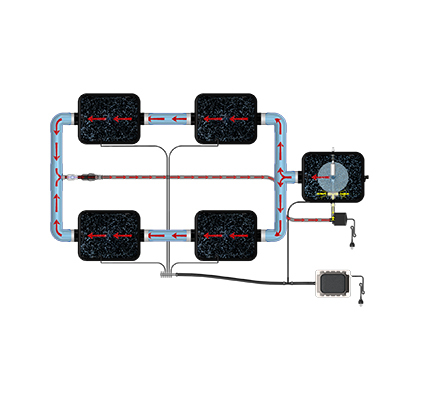 Sizing your Under Current system will come down to a few things: Module size, plant spacing, and system layout. Step one is selecting the number of rows in your system. As you can see from the chart, you can choose between two, three, or four rows. The UC Standard is great for grow tents, whereas the UC Evolution works best in rectangular & residential grows, and the UC Double Barrel is ideal for commercial grows. Then, select your module size. Current Culture systems come in module sizes ranging from 8, 13, to 35 gallons. This will dictate how big your plants grow. The last thing to do is choose your number of sites and your plant spacings. Current Culture systems come in spacings of 18", 25", 30", and 40". We also carry all the parts and accessories you may need to keep your Under Current system running efficiently. For the best results, pair a Current Culture hydro system with Cultured Solutions hydroponic nutrients. Formulated by Current Culture, Cultured Solutions is their line of hydroponic nutrients. These nutrients are specifically designed to increase the efficiency of your hydro system, and provide your plants with everything they need to contribute to a heavy harvest. Current Culture is one of the industry leaders for hydroponic systems, but there are other great brands we carry here at Hydrobuilder. 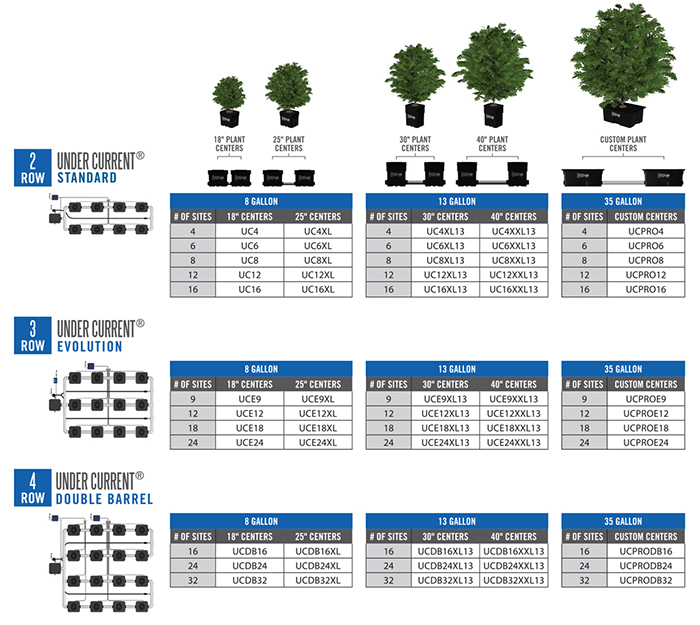 Shop all hydroponic systems here to compare your options!